Music can move mountains, although for Malcolm X it wasn’t moving fast enough. In Kemp Powers pulsating, extraordinarily topical account of four African-American legends meeting one night in a hotel room in Miami, the Black Power activist was calling out Sam Cooke, the singer-songwriter, later dubbed the `King of Soul’, for not putting his God-given gifts sufficiently at the service of `the movement’ for Civil Rights. It’s 1964; Cassius Clay, about to announce his allegiance to the Nation of Islam and a change of name from Clay to Muhammad Ali, has just won the Heavyweight world title fight against Sonny Liston. Gathered in the room are Clay, his good friend, Cooke and NFL star, Jim Brown and Malcolm X. What ensues is a bantering, joshing roller coaster ride through popular music, black politics, allegiances, friendship and quintessentially black masculinity. What, Powers asks in this fictional account but which resonates so strongly with today’s `Black Lives Matter’ campaign, does it take to bring about the revolution? Can each man (or woman although in this context, women it seems are not yet part of the revolution!) bring his own gift to the movement? Malcolm X argues it must be without compromise; Cooke with his smoochy soft-pedalling style , he accuses of selling out. To prove the point, again with strange syncronicity with current news, he puts a track from the recently published young Bob Dylan on the turntable, `Blowin’ in the Wind’. That he says will change minds and should be the kind of song Cooke should be writing. But the times they were `a changin’. Within a year, both Cooke and Malcom X would be dead – the one assassinated by his Nation of Islam’s own followers, the other in a motel shooting that to this day still courts controversy. 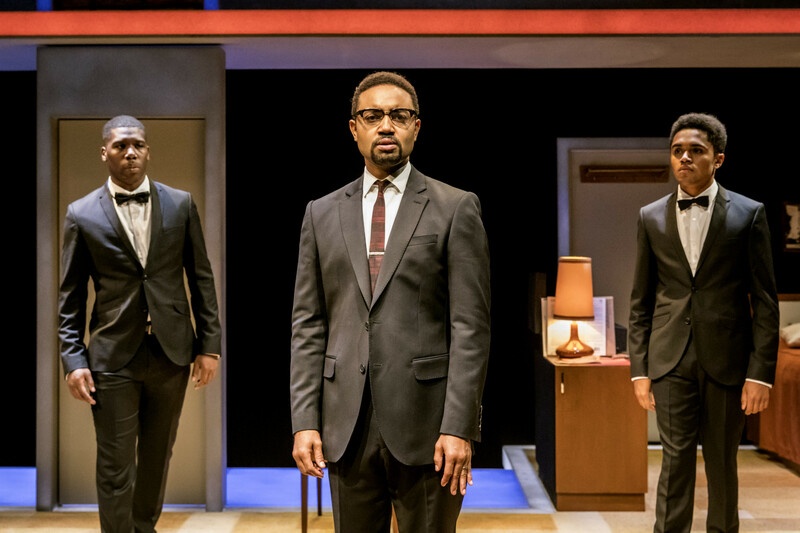 Kwame Kwei-Armah’s production (it was first seen at Baltimore’s Center Stage where he is Artistic Director) positively hums with testosterone, the sound of high fives and hand slapping. Never was there a more exuberantly macho gang of four! But what appeal, too. 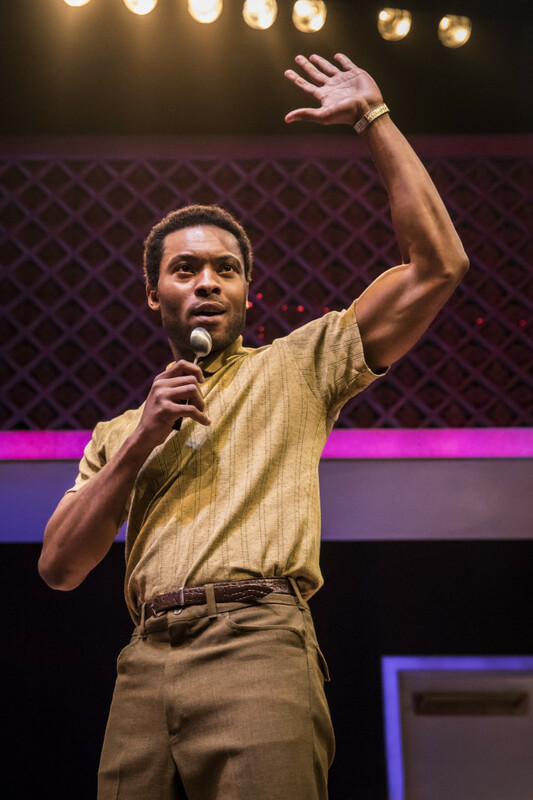 When Arinzé Kene’s Sam Cooke starts crooning to the Donmar’s audience, it’s goose pimple time and you realise all over again, soul and popular music’s seductive power to persuade. A spell binding moment, Kwei-Armah keeps Powers’ dialogue at constant boiling point and though in the end, despite the ominous implication of the presence of two Nation of Islam `minders’, it turns out to be more of a talking heads debate, in the hands of Sope Dirisu’s engaging, fast-talking Clay, David Ajala’s Jim Brown and Francois Battiste’s thoughtful Malcolm X, the cause of Civil Rights couldn’t be more explosive or entertainingly delivered. Good job done! First perf of this production of One Night in Miami… at the Donmar Warehouse Theatre, London, Oct 6, 2016. Runs to Dec 3, 2016. 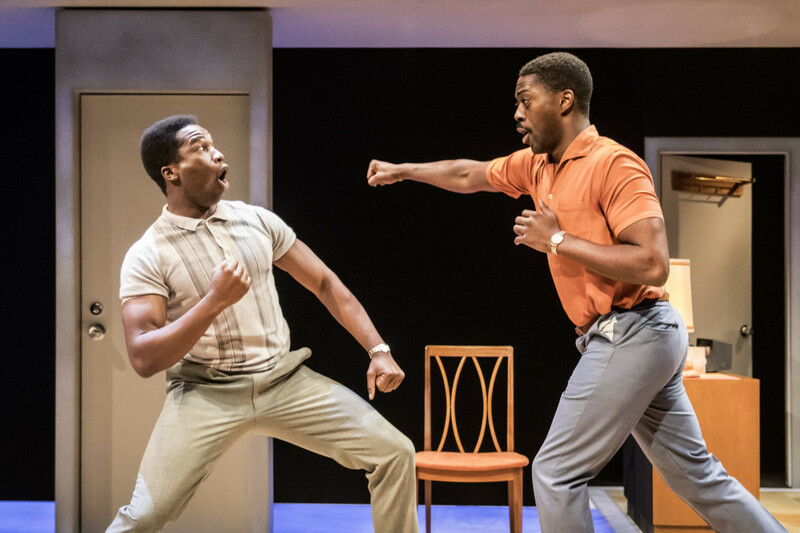 This entry was posted in 2016, Reviews and tagged Civil Rights, Donmar Warehouse, Jim Brown, Kemp Powers, Kwame Kwei-Armah, Malcolm X, masculinity, Muhammad Ali, Nation of Islam, Sam Cooke on October 16, 2016 by Carole Woddis.